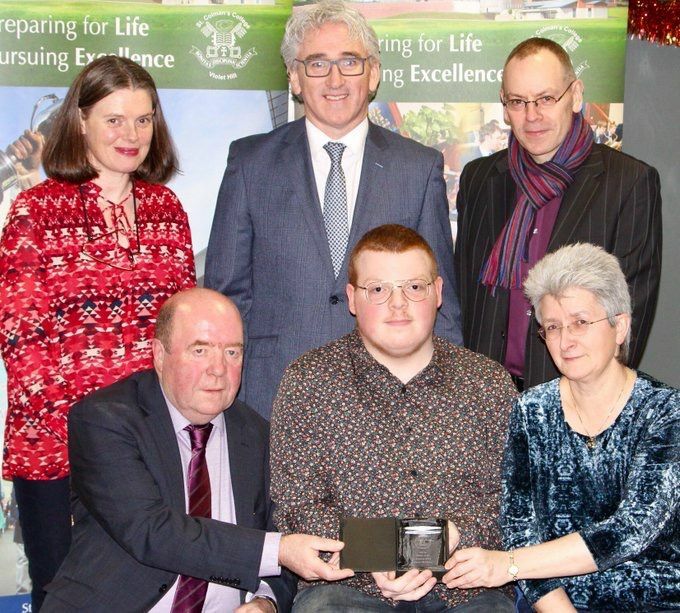 Conor McGlone is pictured with his parents, who are alongside Mr McKinney, receiving his award from Guest Speaker Mr Colin Bell Kevin Bell Repatriation Trust and his teacher Head of Music Miss Sinead Frame. 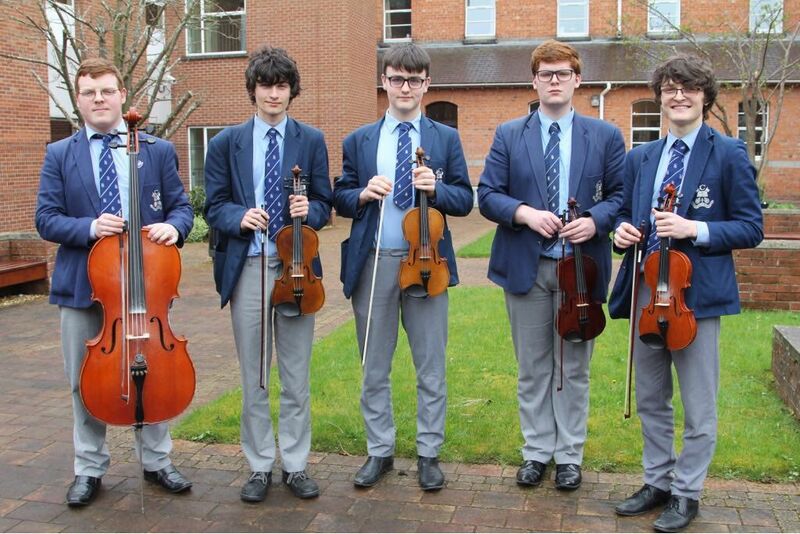 Conor was 3rd in NI in Music at A Level. 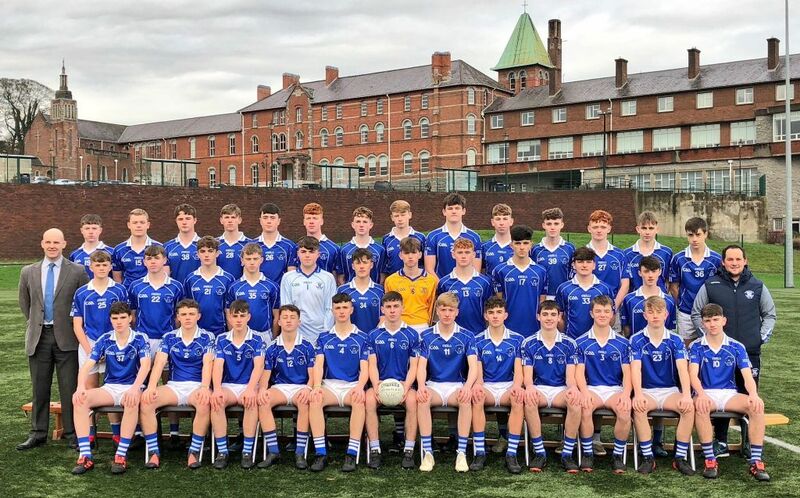 Well done to Pádraig Clancy, Adam Crimmins and Peter McGrane who were awarded Queen’s Rising Stars after a trial process at QUB. They are pictured here with their Manager Mr Franklin. Open Day 2019 not to be missed! 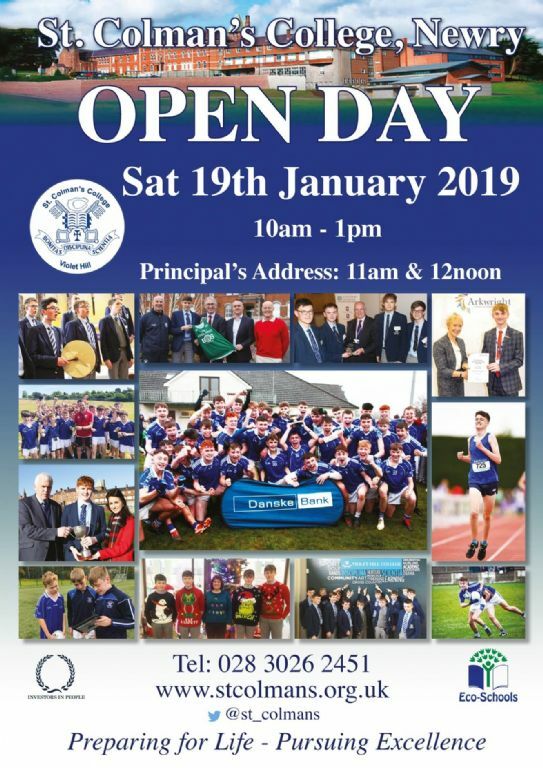 St Colman’s College Open Day 2019 promises to be a wonderful, fun-filled day, and we are eagerly anticipating the arrival of hundreds of prospective pupils and their parents. A very warm invitation is extended to those pupils who are thinking about studying at Violet Hill post 16 as well as post 11. It is always such an interactive and dynamic day with so much to see and do. 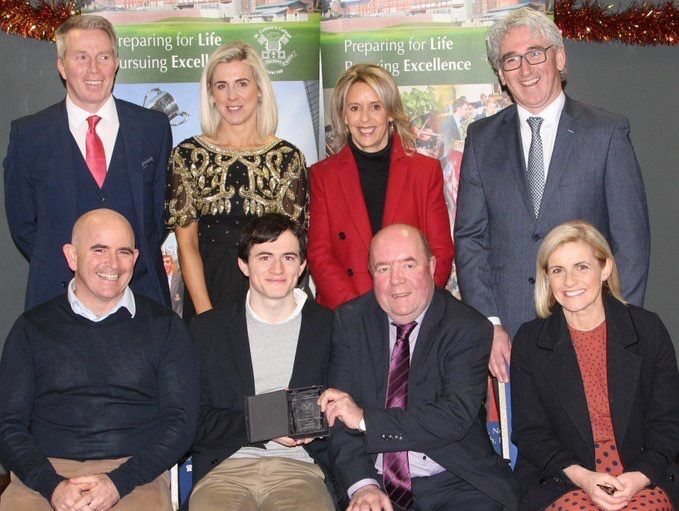 Conal Scullion, pictured here in the front row, was selected by Principal Mr McKinney for his Gradam an Phríomhoide (Principal’s Award) at Prize Giving 2018. 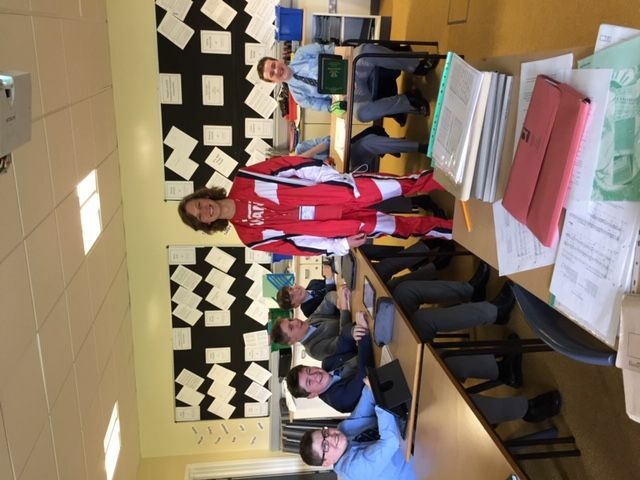 Conal was awarded with a Clann Cholmáin honour (3 A Grades or better), a leadership award, Top in NI Award in Government and Politics and was also Top in English Literature and Government and Politics in Violet Hill. Well done Conal. Rannafast Cup Captain Dan McCarthy presented the coveted trophy to Mr McKinney today at a Reception for the newly crowned Ulster winners in our Assembly Hall. 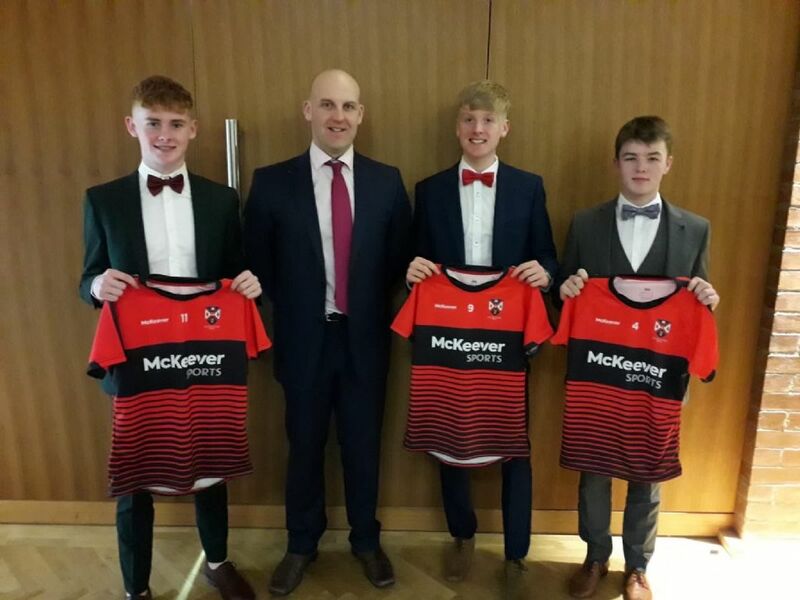 Pupils from Year 8 - Year 12 gathered to congratulate these great young men and Mr McKinney (Principal), Mr McMahon (Coach) and Mr Franklin (Manager) were all praiseworthy of the team in their respective addresses to the audience. These are proud days for our staff and pupils.